Begin with a votive candle holder. This one has a slight distressed / mercury glass look. Grab some scrapbook paper, make a template of the glass (add extra to one side for overlapping), cut the template from scrapbook paper. 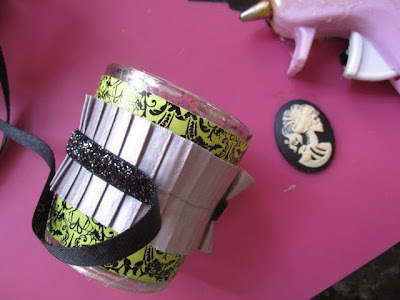 Coat the back of the paper with Mod Podge and wrap around the candle holder. Overlap across the back and top coat with a layer of Mod Podge. Hot glue a strip of wide pleated or lacy ribbon around the center of the candle holder. I used this one from my supply shop. 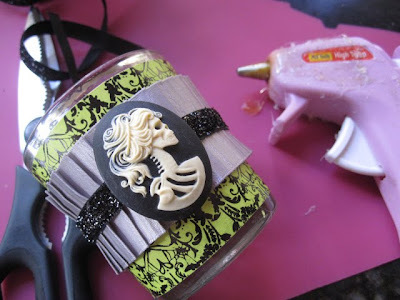 Glue a narrower ribbon down the center of the wide ribbon. I used the black metallic ribbon from my shop. Last I glued one of the Victorian skull cabs in the center of the votive. I just love it! Gorgeous!!! I cant say anything else, I just love it! Ahhh! 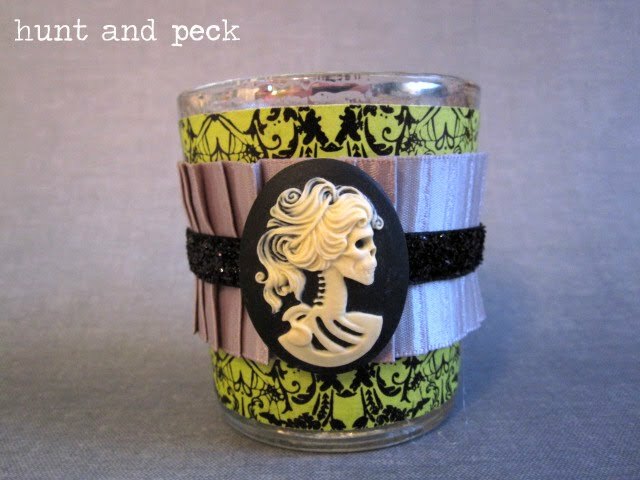 I absolutely LOVE the votives! Thanks!! I really love the skull cabs! !